When we invest in new electric garage doors, we basically invest in our security and convenience. We make different choices in order to see the door moving at a certain speed, having a specific level of tolerance against elements and hardship, and lasting for a long, long time. It is one of our greatest investments! We expect to see our place gets transformed from a poor looking home façade into a fascinating one! 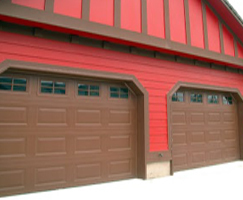 We anticipate smooth movement of all garage door parts and most definitely complete safety for our family. The truth is that new panels are strong and if they are insulated, they will also provide great temperatures within. It is also true that modern systems and electric garage door openers are amazing and they won't only move the door relatively fast but they will ensure our safety since they come with great features. Though, it's good to remember that no matter how much these systems have improved, without our intervention to fix problems and lubricate the parts, the system will start malfunctioning. That's why we make so much fuss about garage door maintenance. Have you ever thought what may happen if you completely neglect your overhead door? Gradually, parts will start malfunctioning. They will become noisy, they will eventually rust, some of them will loosen up, the door will not be balanced and might jam, the whole system might start vibrating and the sensors won't offer you any assistance if the door collapses. This is definitely an extreme scenario but it's not fiction altogether. How will we feel if we were deprived from water and food for an extended period of time? Garage doors are machines but they still need our attention. When problems are taken care of at an early stage, they won't have the chance to grow and become real threats to our lives or even jeopardize our convenience. Do you know what great wonders lubrication maintenance can do? It will keep parts moving properly, smoothly and without making noises and will prolong their lifespan. When the whole system is inspected on time, small hardware is tightened, the sensors are adjusted, the door is balanced and worn parts are replaced, you will have nothing to worry about. The system will last longer, your safety will be guaranteed, your home will be secure, the parts won't be noisy, your house will look great and your investment will be a wise choice.